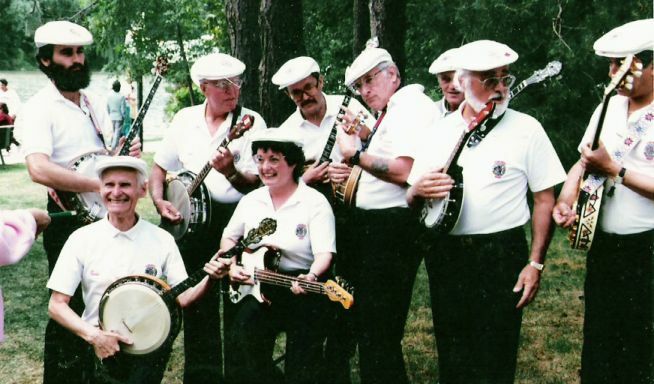 The Toronto Banjo Band was formed on January 19, 1986 in Scarborough, Ontario, just east of Toronto. At the initial meeting held at Gerry and Margo Pederson's home, there were twenty-one banjo players present. 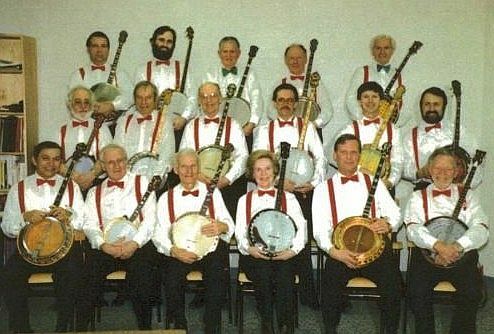 Missing from the meeting due to a previous engagement but committed to the effort to form a banjo band was Borgy Borgerson rounding out the commitment by twenty-two musicians. Within a couple of hours, an Executive was formed, and then a jam session took place. Tim Allan was voted in as Musical Director at the first meeting. However, Borgy Borgerson also assumed this role on several occasions due to Tim's prior commitments. Interestingly at this inaugural meeting, a few egos were shattered. Until this initiative to form a banjo band, it had been difficult to find and hear other banjo players anywhere. Immediately a few of the players had to accept that they were not as good as they thought they were. In fact, a few of the musicians decided to go back to their own safe haven of banjo interests finding it difficult to fit into a banjo band setting. With the remaining banjo players persevering during this first gathering, it was clear that the formation of a banjo band would be successful. And although the idea of all members joining the Union was also considered, it was vetoed by the members of the TBB. Along with Tim and Borgy, leadership and musical directorship were also provided during that first year by a number of other accomplished professional banjo players. They were Jim Groulx, Bill Stewart, Ernie Mee and Jamie MacPherson. Over the next few years, a number of TBB members also honed their entertainment skills and moved into the ranks of becoming professional banjoists in the Greater Toronto Area. (GTA) Some of the more notable names were Mel Collie, Bob Armstrong and Earl Craddock. Other members also branched out to play in other groups and bands as amateurs. Many of these banjoists continue to perform with the TBB today. Although the membership of the TBB has changed over the years, Jim Groulx as the band's initial President, continues to be the band's Musical Director today. Even some twenty years later, Jim is unquestionably 'the glue' for the TBB in terms of song selections, musical arrangements and a wonderful 'banjo band' sound. Jim also performs as a soloist and as a banjoist in another Dixieland band that performs throughout southern Ontario. Early in the band's history, the Pederson's home was used for rehearsals. But as the band grew, rehearsals moved to a print shop in Concord, Ontario, just north of Toronto. This print shop was owned by Ted Fallis, a TBB member. During this period, practices found many of the banjoists competing for space by sitting on top of or between printers or printer-related equipment. Certainly the acoustics within the shop were a challenge as well. But eventually the band found better rehearsal facilities and for a number of years now, the TBB has held practices hi-monthly in an elementary school located in Woodbridge, Ontario just north of Toronto. Finally in June, 1986, the TBB held its first concert at Glen Park in the heart of Mississauga, Ontario just west of Toronto. With a program of both band numbers and solos performed by the professionals, the show was held on an open stage showered by the sun on an extremely hot and humid day. Certainly for the residents of the area, they were clearly and pleasantly surprised to have heard a banjo band for the first time. Undoubtedly, the TBB were a success that afternoon and well on their way to becoming a successful musical band in the Greater Toronto Area (GTA). From the inception of the TBB, the mandate was and continues to be one of encouraging and fostering the performance and appreciation of banjo music. The genre of music performed by the banjo band is essentially Roaring Twenties, Dixieland, and 'turn-of-the-century' (1890 to l930's) 'sing-along' music familiar to most Canadians and Americans. For the type of music the TBB plays, members' banjos are either tenor or plectrum four-string banjos. In the past, banjo ukes were also utilized. For well over one hundred and fifty years, the banjo has continued to be an extremely popular instrument. Throughout this long period, it has been associated with slavery, gold rushes, early American settlers, many of the first live musicals and minstrel shows and even performances by classically trained musicians in the late nineteenth century. Its popularity has varied throughout the last number of decades but certainly today it has found a new renaissance. in fact, it should be noted that the banjo remains as America's only native instrument and the TBB continues to play a part in preserving that heritage. Although the TBB receives honorariums for performing, none of the members are paid to perform. Rather, each musician plays for free and for the love of the music. Any monies received are used by the band for expenses such as rental facilities, outfit replacements, sound equipment and periodically, travel expenses. Our primary reward is to see the smiles on our audiences' faces and the enjoyment they receive in singing along to many of the songs we perform. Since 1986, the TBB has performed at hundreds of venues including but not limited to, festivals, boat and cruise events, dinner shows, park concerts, municipal and town fairs, banquets, street fairs, event attractions, business functions, parades, grand opening events, receptions, private special occasion parties, (e.g., birthdays, Christmas, anniversary, etc.) senior citizen and nursing home facilities, fund raisers, picnics, etc. Some of our more memorable and repeatable performances are the RBC Seniors' Jubilee held at Roy Thomson Hall, the annual Markham Fair and CITY TV's "Breakfast Television" amongst others. 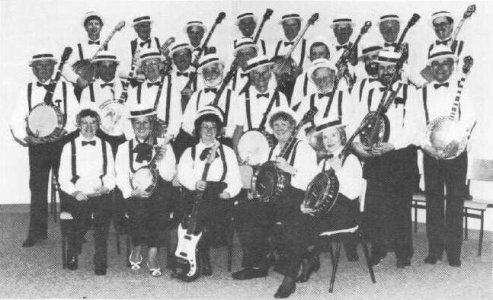 In both 1989 and 1995, the Toronto Banjo Band hosted the Fretted Instrument Guild of America's (HGA) annual convention in Toronto. This convention is held in a different city in North America each summer. With a membership of approximately three thousand members, FIGA has been the nucleus for tenor and plectrum banjoists around the world for a number of decades now. The annual FIGA convention draws hundreds of accomplished banjoists from around the globe and makes it the premier event to attend for both banjo players and banjo enthusiasts today. With hundreds of banjoists attending, this convention provides a number of afternoon and evening performances, workshops on the banjo, banjo and banjo related material for sale by banjo vendors and banjo manufacturers, banjo lessons and four to five days of banjo jamming. As with each FIGA convention over the years, the TBB was commended on holding two very successful events and has more recently been encouraged to hold a third convention in Toronto once again. In 2003 and with Jim Groulx's encouragement, the Toronto Banjo Band recorded and produced its first compact disc (CD). After hearing the TBB perform live, our first CD received tremendous sales from our audiences. It encouraged us to produce this second CD entitled "The Toronto Banjo Band Special Edition." We believe it will become a classic banjo CD since it includes as guest artists, many of the finest Canadian four string banjo players over the past fifty years. We anticipate that it will be an inspiration to future generations to learn the four string banjo. With twenty-five active musicians and referrals from live performances, the TBB has recently been accepting performance engagements in a constantly widening geographic area. As one of only two active banjo bands in Canada, the TBB in its twenty-first year hopes to continue in bringing pleasure and enjoyment to a variety of audiences. During this period of over two decades, the Toronto Banjo Band has been home to over ninety musicians in total.